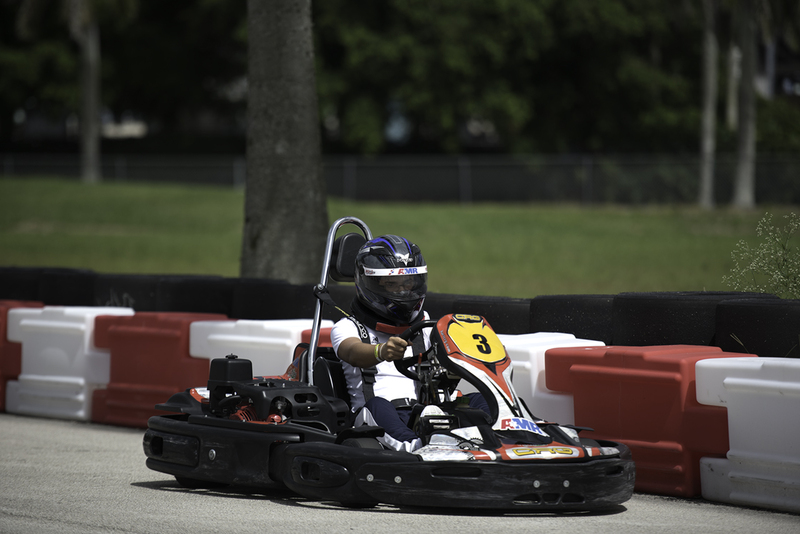 Located on-site at the Homestead-Miami Speedway, the AMR Homestead-Miami Motorplex Presented by MG Tires is a professional grade karting facility and only a 30-minute drive from downtown Miami. Come on out and enjoy our world-class facility designed and constantly improved on by industry racing professionals with a meticulous emphasis on safety and usability. The AMR Homestead-Miami Motorplex Presented by MG Tires features a BRAND NEW, state-of-the-art rental kart circuit that measures out at 0.3-mile in length. AMR Motorplex’s fleet of 26 CRG Centurion Rental Karts provide an adrenaline rush like no other, reaching speeds up to 45 mph! Our karts feature cutting-edge technology to offer both a fast and safe racing experience. Our unrestricted, 9 Horsepower Rental Karts provide an exciting and high-adrenaline racing experience to both individuals and corporate groups alike - seven days of the week! Enjoy the thrill of reaching speeds up to 45mph in our fast and safe karts, while racing around our outdoor 0.3-mile, 3-turn, world-class, professional grade rental circuit. $100 for a 5-race package. Can be divided between multiple drivers. $195 for a 10-race package. Can be divided between multiple drivers. AMR Motorplex is proud to offer active military and veterans a non-transferable special rate of $20 per Rental Race. This includes all active-duty military, reservists, guardsman, retired military, disabled veterans and any other military personnel with valid military identification. The rental circuit at AMR Motorplex provides a professional grade racing experience, with high-performance Rental Karts that can reach speeds of 45mph. In order to reach the pedals on our adult karts, all drivers must be 60" or 5 feet tall. Drivers under the age of 18 must have a parent or guardian complete the AMR Motorplex Consent Form and have it notarized if the parent or guardian is unable to accompany the driver. Weight Limit: Although we do not have a weight limit restriction, we have found that drivers over 250 lbs. do not typically fit comfortably or functionally in the seat of our standard karts. However, we are proud to note that we do have 2 CRG “Big Foot” rental karts in our fleet, which are meant to fit larger drivers. Availability is first-come, first-serve, so please request these karts if you think you will need them when purchasing your sessions.